We work hard, and work well. 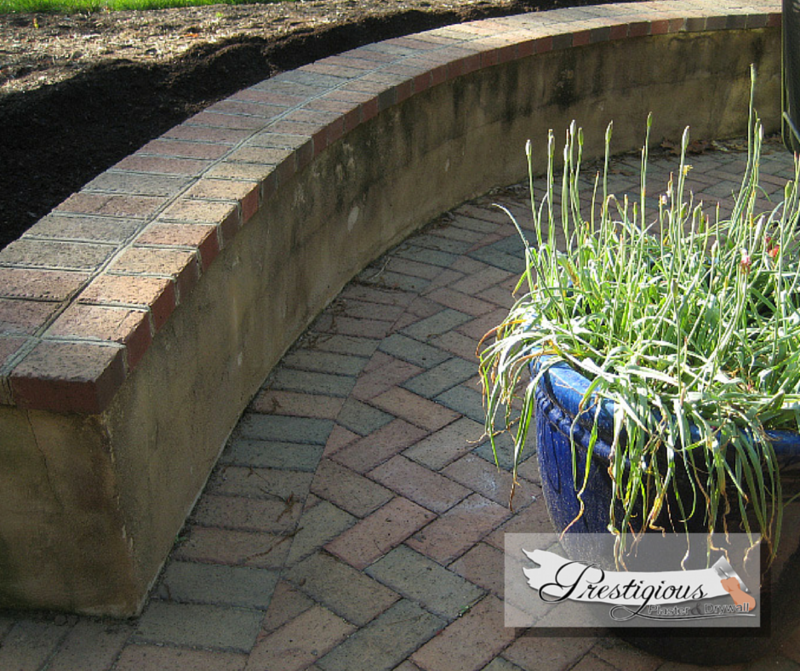 These posts feature samples of our work, to give you an idea of how we may work for you! Feel free to browse them, and if you have any questions or are ready to get started, get in touch via our Contact Page. One of the best parts of running a small business is when customers go out of their way to appreciate you! 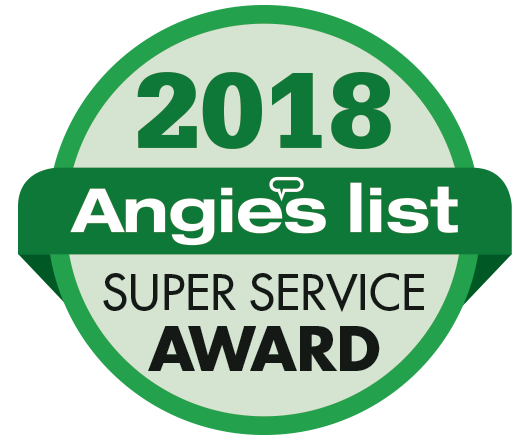 We're honored that again this year we were selected to receive an Angie's List Super Service award. What that means is that our customers like us enough to tell others. That's the best feeling ever. So, what are you waiting for? if you have Drywall or Plaster repair needs, contact us right now. With spring peeking its head around the corner, with it comes home buying season. If you've been putting off that drywall repair or finally finishing the basement to get the value of your home in peak selling condition, now's the time. We've got some availability in the coming months to get the drywall job done right. You could probably get it done cheaper from some shop offering "free estimates" or some other gimmick. We rely on the fact that our customers love us, and our work is excellent. We're not salesmen, we are the best in the drywall business. 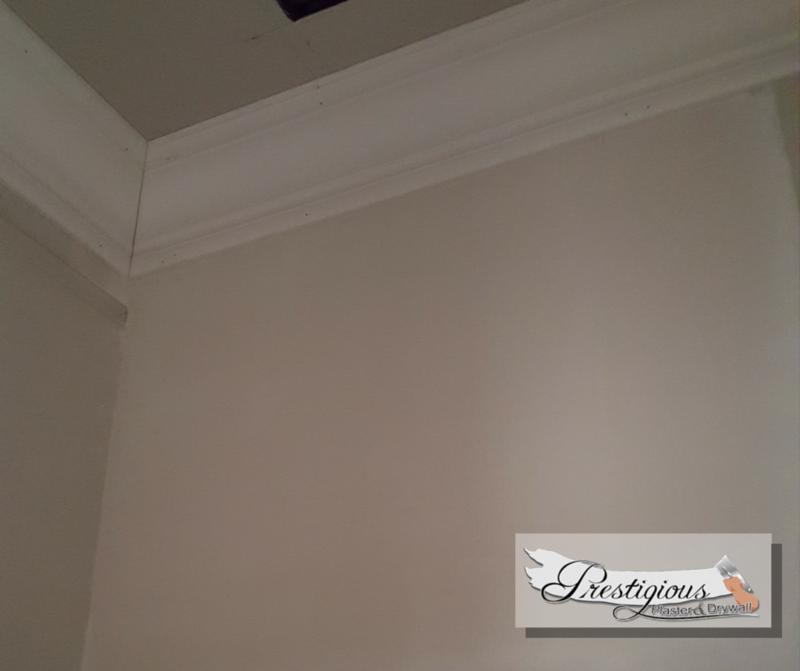 You can trust that when you are dealing with Prestigious Plaster and Drywall, you're not being oversold or upsold, you're getting high quality work, done the right way. Spots fill up fast, and are first-come first-served. Contact us below to get started! Recently we got the chance to help out a customer with some water damage as well as a structural crack in the foundation wall in their garage. We were brought in for the EIFS (synthetic stucco) work that needed to be done to repair the water damage. Have Allergies? 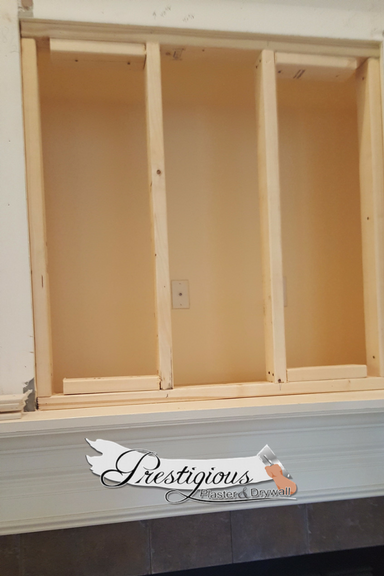 Don't Attempt your Own Drywall Repair! Recently we were contacted by a client concerned about getting a repair done in a household with allergies. 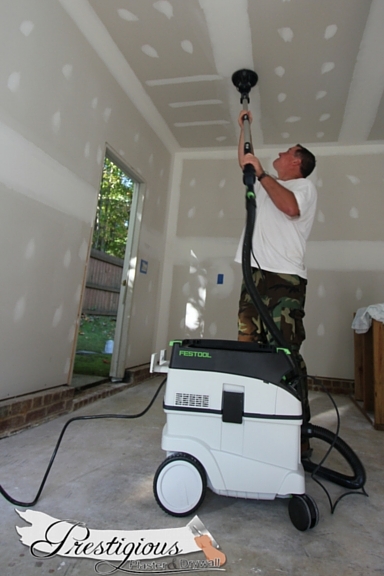 The best drywall finisher in the world will produce dust using the wrong equipment. So if you are looking to DIY and need to avoid dust, the first step will be to shell out the premium dollars for dust free sanding equipment. How do you learn how to prevent the dust in a drywall repair? Even the best equipment out there will produce dust if you don't operate it correctly. There's really not a shortcut: you figure out how to do it right by doing it wrong first. Tim with Prestigious Plaster has the years of experience that it takes to get really good at this stuff. You can benefit from those year of experience by hiring Tim. Work done was excellent and there was no drywall dust. This was very important to our family which has allergies. 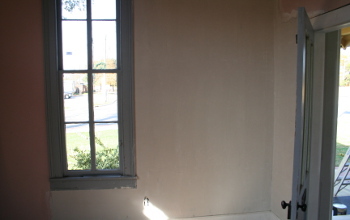 Plaster Repair in Five Points Area of Raleigh. 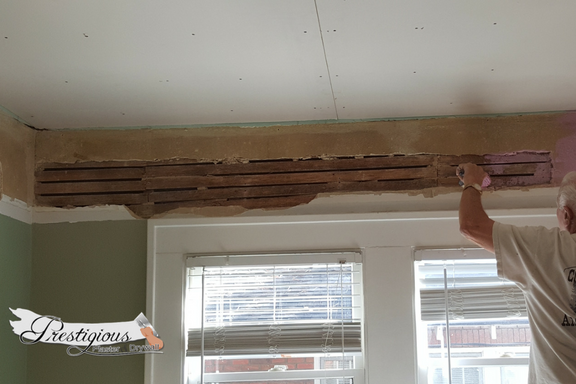 Recently we got the chance to do a plaster repair job in the 5 points area of Raleigh. 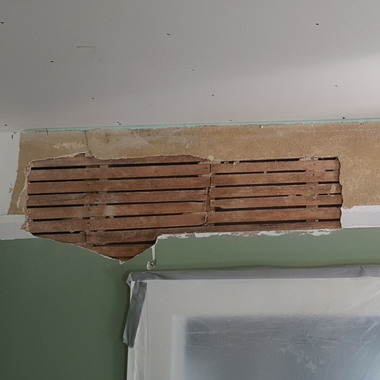 First, some "before" pictures: The lath is visible, and we first needed to remove the crumbling old plaster from it. 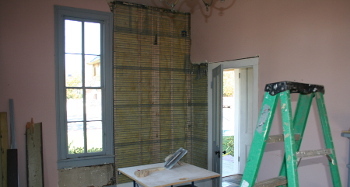 The lath is visible, and we first needed to remove the crumbling old plaster from it. More detail of the old plaster in need of repair. More detail of the old plaster in need of repair. 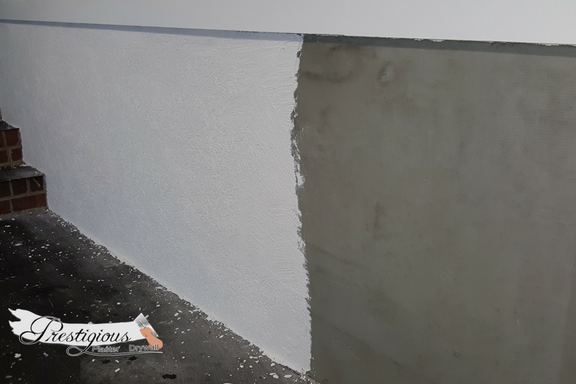 Once we got the damaged plaster removed, the next step was to replace the brown coat, unless the surface is too uneven and we use a scratch coat first. This provides the structure for the finish coat to adhere to, and so the better we did at this step, the better the final product will look. Our decades of experience help out here. The brown coat and lime coat steps provide the foundation for the final coat. The brown coat and lime coat steps provide the foundation for the final coat. Another shot of the "during" process, in prep for the gouging or finish coat. Another shot of the "during" process, in prep for the gouging or finish coat. Finally, the finish coat, made from a mixture of lime and gauging plaster, is applied, and ready for paint or wallpaper! All ready! 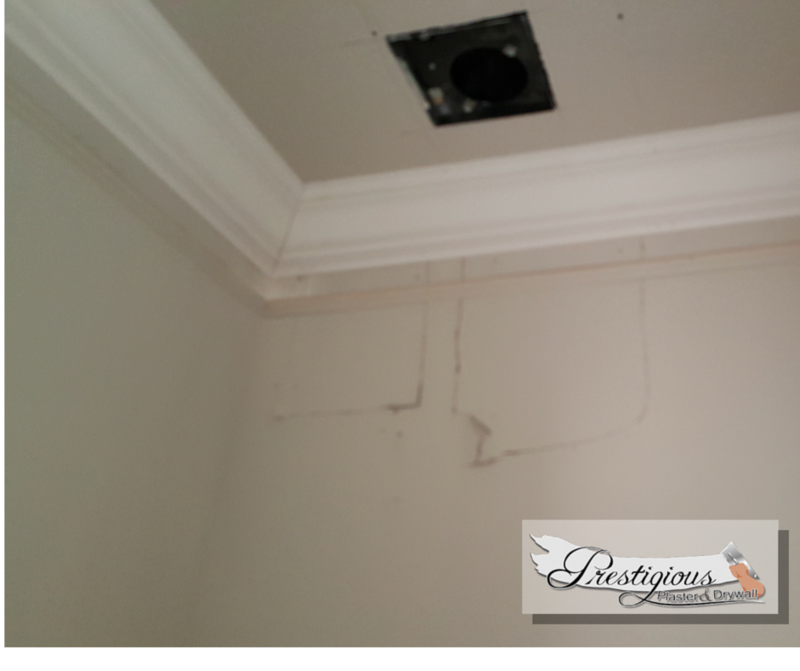 This repair will last for years, and by getting Prestigious Plaster to do it, the customer saves money and time in the long run. 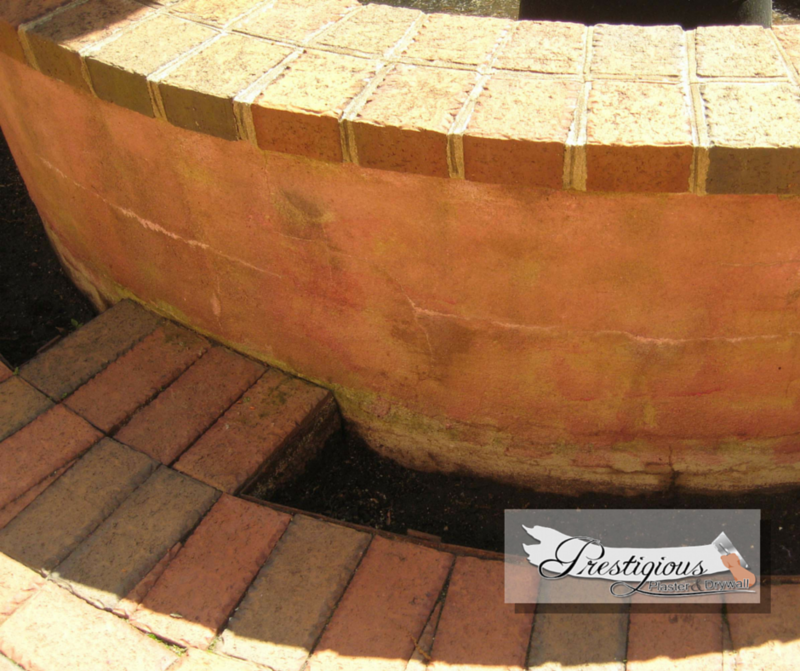 One last "after" picture of a Plaster Repair well-done. If you are a property owner in the south, especially near the coast, you are well aware that mold can be an issue. 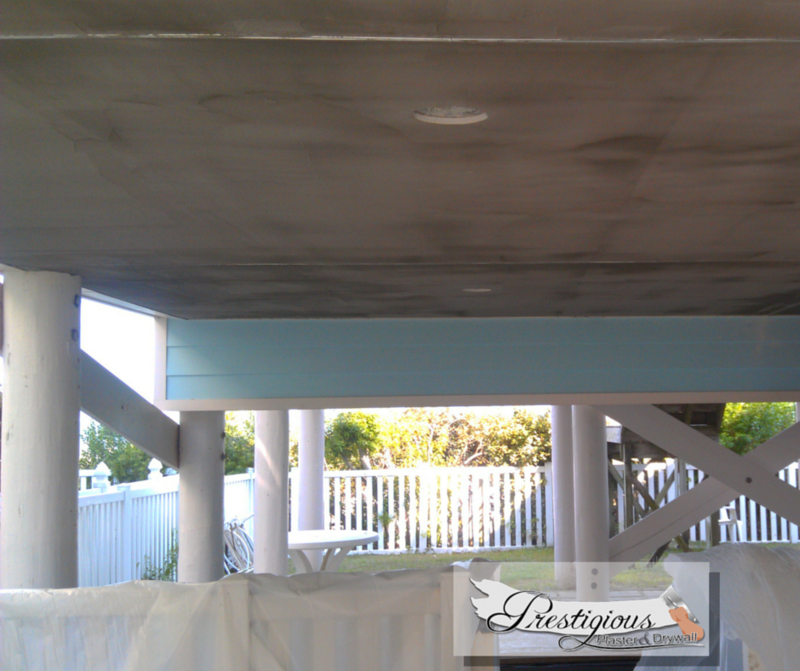 A recent client contracted us to repair the ceiling on their carport/pool area, and we were able to finish the job in three stages, ensuring mold resistance while dramatically improving the appearance of the ceiling! The finished product! Clean, professional, and sharp-looking! So, what are you looking for? Contact us today. 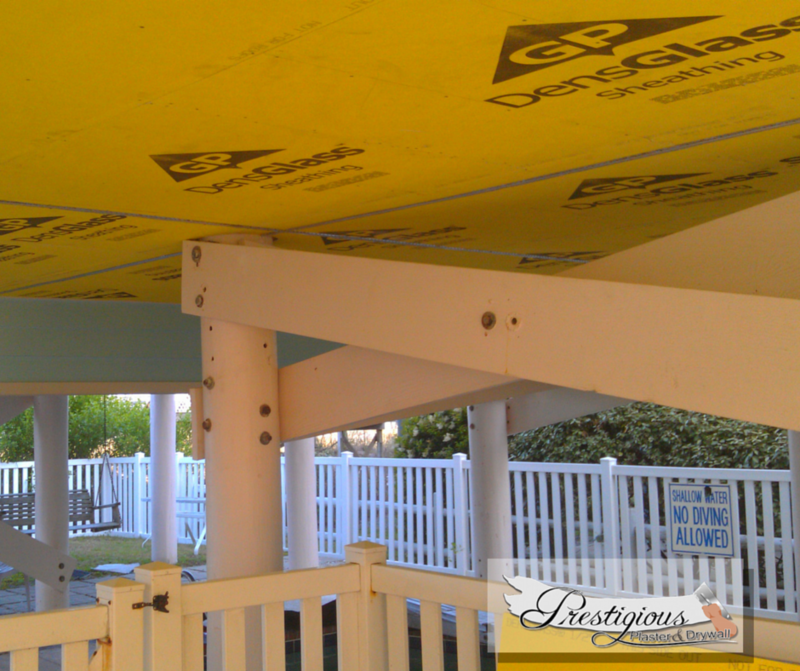 In the first step, we put up a layer of mold resistant sheathing. 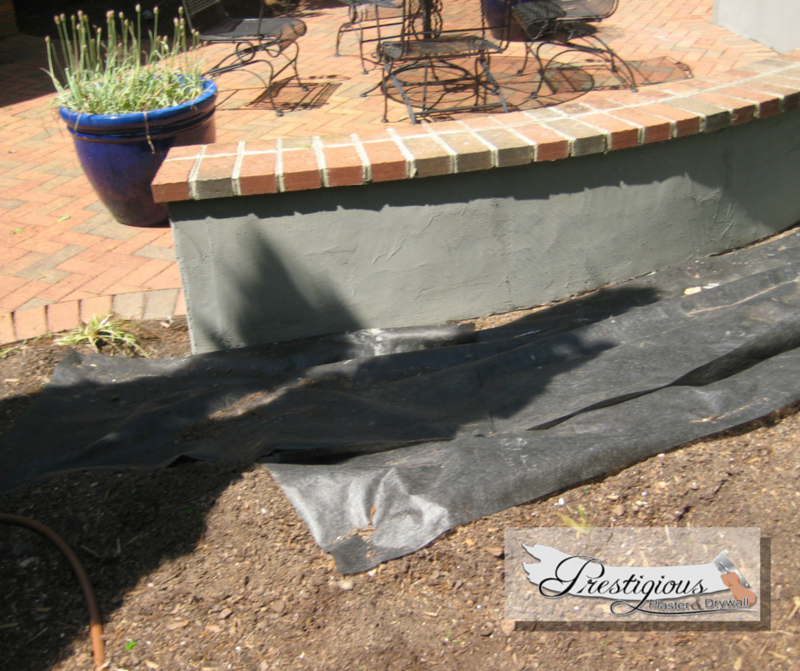 This is a crucial step that (even though you can't see it) keeps you protected against future mold. This is the step others might skip, where we ensure you don't have to call another contractor to fix mold in 6 months. Next up, we put a base coat down. This evens everything out, in prep for the final step. Have you ever Googled "DIY Plaster Repair" and then regretted the decision? The first five results show videos (some 15 or 20 minutes long!) 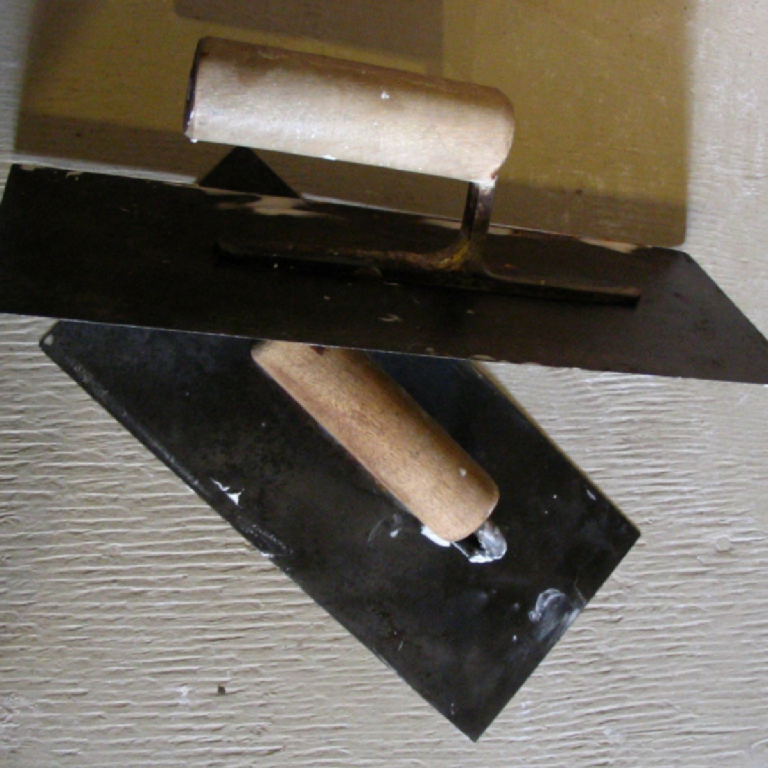 showcasing no less than 3 different methods for doing that plaster repair. They all also start with a moderately funny disclaimer of sorts telling you that "this isn't a high end plaster job" or that "you can do this yourself." Let us decode that for you: they are teaching you a hack way of repairing plaster which won't look as good as a professional job. And worse, they all seem to disagree with one another! Don't get us wrong, we are not fundamentally against DIY plaster repairs (or DIY home repair in general), but you must know that when you perform those types of repairs, there's always the risk of it not looking good enough, or the job taking months when it could have been done in days. As the old adage goes: Done Right, Done Quickly, Inexpensive, choose any two. If you want to ensure that you end up with a plaster repair you can be proud of, don't put your fate in the hands of YouTube. Get it done right the first time by contacting us below. When you are looking for plaster repair, the main factors that you want are professional service (does it look good? ), affordable prices (is it worth what you paid?) responsive communication (does your contractor show up on time, leave the place better than they found it, and make you want to tell your friends?) Here's Tim making another customer happy. Contact him today. There's more than just hunting for a bargain. You need to trust that the person you are letting into your home or business are going to be worth the money that you pay, and is going to do the job (and everything else) with professionalism and cleanliness. 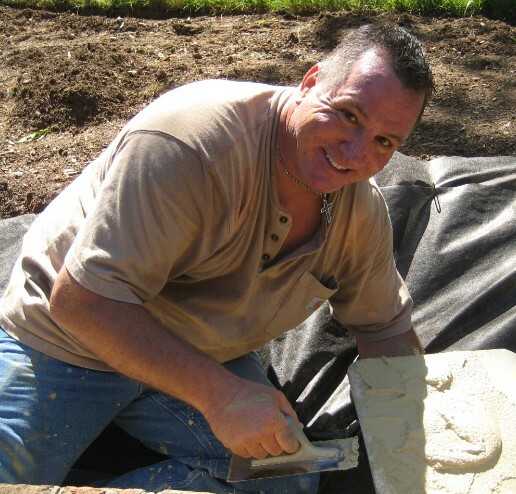 Tim Kiessling with Prestigious Plastering and Drywall has 3 decades of experience. You don't stay in business for that long by doing less than top-notch work, at affordable prices, while being responsive to the needs and wants of your customers. We're not the cheapest option out there, because we do the best work around. 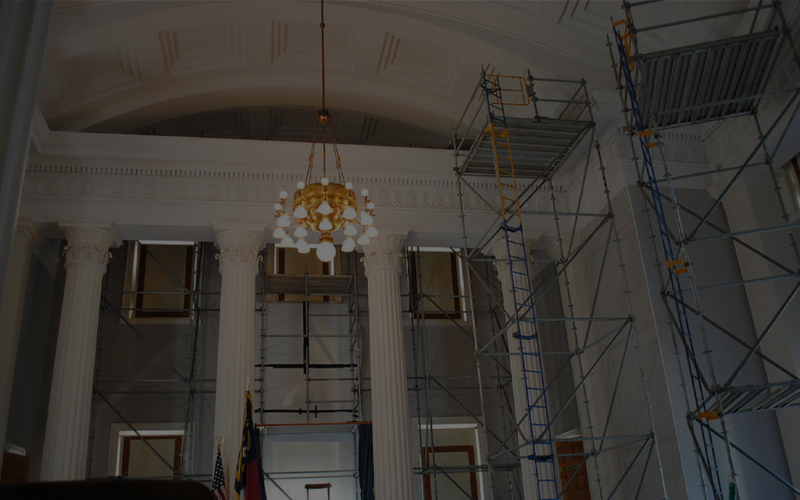 Trust the same team who contracted to repair the NC State Capital Building to give you the assurance that your work is done right, the first time. Browse around the site, check out our services offered, and then... Give us a call at (919) 669-3512 or use the form below to get in touch. 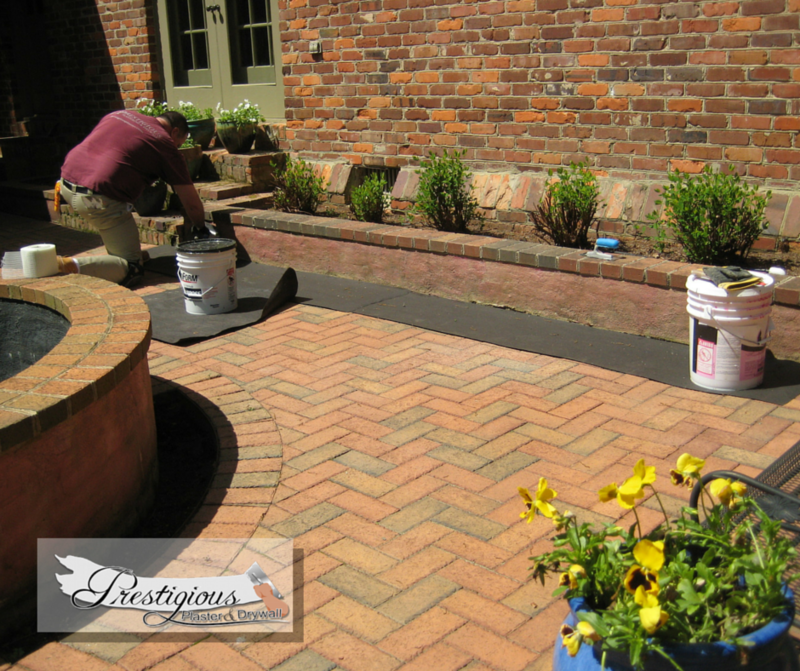 Recently we got the chance to help out a fantastic customer in Cary. 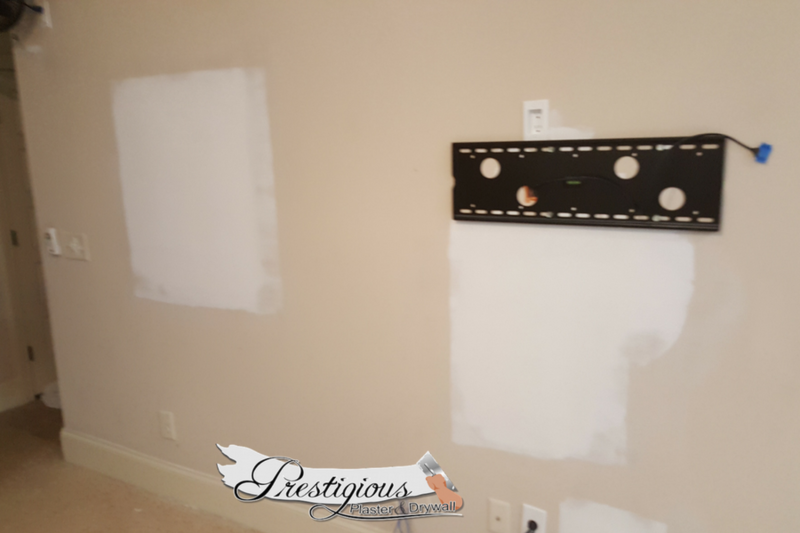 Because he did such a great job in his review, we'll let him explain to you the benefits of hiring Prestigious Plaster and Drywall: We have used Prestigious Plastering and Drywall for drywall repairs at our home residence in Cary at least two other times in the past. Tim is a true professional and an expert at his craft. When we finally were able to fix a foundation problem under our house several months ago, we didn't even consider calling anyone else for the wall repair that was needed afterwards. The section of drywall he replaced had bowed out almost two inches over time. The bowed section was several feet long and on the main wall in our living room, just to the right of our fireplace. It was an eyesore that you would see as soon as you entered the room. Now it looks as good as new, maybe even better! We have two other properties (in two different cities) and we are almost always having an upgrade or repair going on at one of the three places. I can tell you from experience, that Tim is not only the best at what he does... he is one of the best service contractors we have ever used from any field. He has always been prompt in response via phone or email. He is very quick to come out and give an estimate and the quality of his work is unquestionable. The job he just completed for us was no exception. We also like that he uses top notch equipment and products. His power sanding tools have attached vacuums, which cuts down on dust and debris tremendously! My wife and I highly recommend Prestigious Plastering and Drywall and would not hesitate calling Tim again in the future! Here's some photos of during and after the repair. 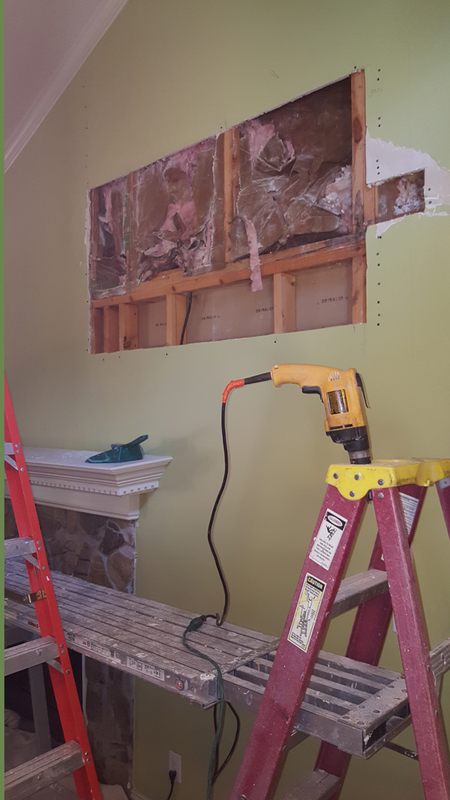 large hole in a living room wall, ready to be repaired Having removed the old section of bowed drywall. drywall in the middle of a repair. What Tim calls "Hanged and Taped" and ready for finishing. finished drywall, ready for paint. Finished and ready for paint! It was a pleasure helping, and we so appreciate the kind words. Want this level of service? Contact us below to get started. We recently had the opportunity to help a customer by framing in the TV Nook above their fireplace. The customer is on Hillsborough Street in Raleigh. With the advent of larger flat-panel TVs, the value of having a built in nook above the fireplace in many homes was basically negated. Homeowners are left with a useless hole above the fireplace too small for a TV, and to large/out of reach for any other practical use. That's where we came in! First, we framed in the area in a way that can easily hold the weight of a mounted flat panel TV: framed in tv Nook. The key is to frame in such a way as to be able to hold the weight of new heavy TVs with their mounting assembly. Next, we roughed in the sheetrock to match the surrounding area. roughed in drywall for TV nook The key here is to rough in the dryway precisely so that in the next step you can finish it without a noticeable ridge. 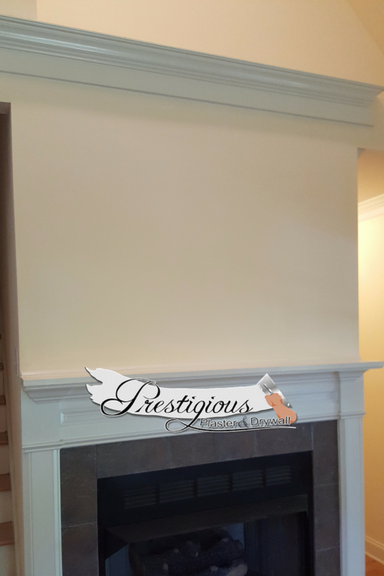 Finally, we added the finishing touches to perfectly match the rest of the drywall: finished drywall above Fireplace. The finished product, like that glaring hole in the wall was never there! All that was left was to mount the TV, and turn on a classic Bruce Willis film! 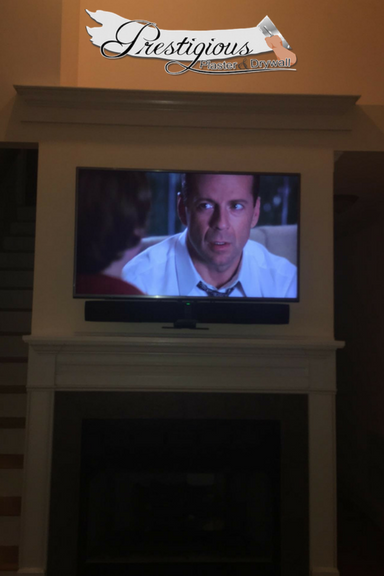 mounted tv on finished drywall with tv image of Bruce Willis. The only thing that looks better than Bruce Willis is the awesome drywall work. What are you waiting on? Contact us today to take care of that ugly 90s TV nook in your house! With spring peeking its head around the corner, with it comes home buying season. If you've been putting off that drywall repair or finally finishing the basement to get the value of your home in peak selling condition, now's the time. We've got some availability in the coming months to get the drywall job done right. You could probably get it done cheaper from some shop offering "free estimates" or some other gimmick. We rely on the fact that our customers love us, and our work is excellent. We're not salesmen, we are the best in the drywall business. 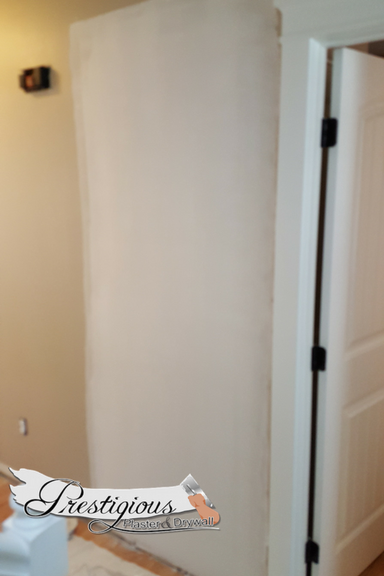 You can trust that when you are dealing with Prestigious Plaster and Drywall, you're not being oversold or upsold, you're getting high quality work, done the right way. Spots fill up fast, and are first-come first-served. Contact us below to get started! 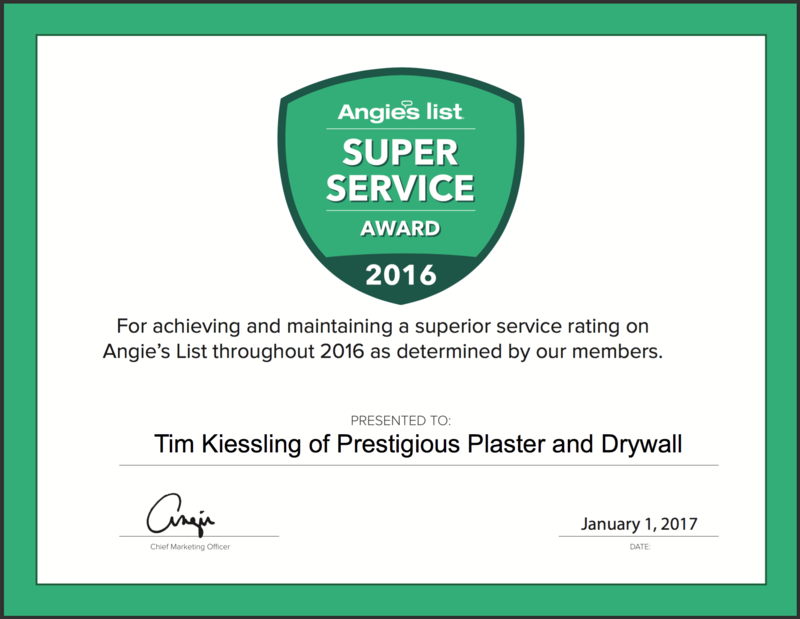 We are proud to announce that we've won another Super Service Award from Angie's List for 2016. We take it very seriously to treat our customers right, to be well worth the money we charge, and to be the type of company customers recommend to their friends. While we don't do it for the awards, it sure is nice to be recognized by our customers, who have gone out of their way to review us on Angie's List. angie's list award certificate This might look like an award from a website. We see it as an award from YOU, our customers. So if you or someone you know needs Drywall or Plaster work in Central North Carolina, why not go with the award-winner? Contact us today to get started! 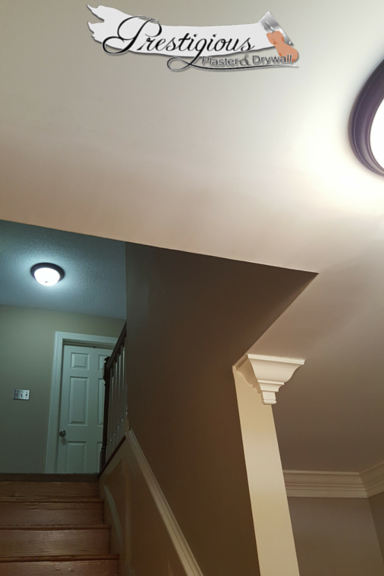 Can Lighting Installation needs Professional Drywall Repair! 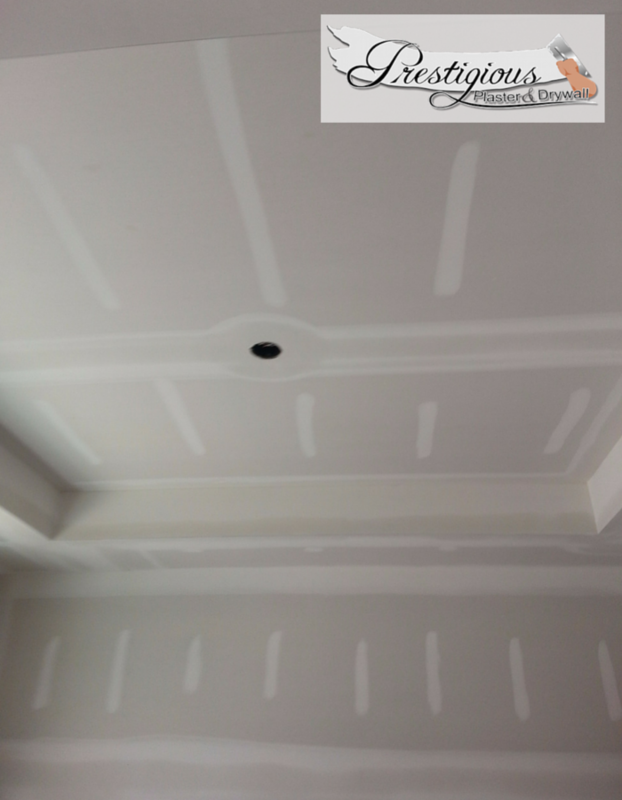 Recently a customer in the Wescott subdivision in Holly Springs got in touch because they had some can lighting professionally installed, and neede to patch their drywall as a result. They made the right call, to Prestigious Plaster and Drywall. The pictures, as always, don't do it justice. 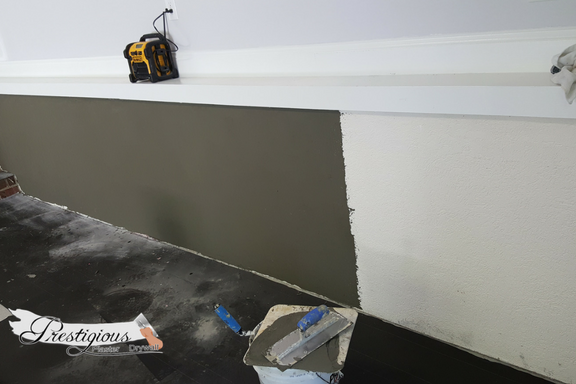 Here's the finished product, ready for paint: Looking to take all the guesswork out of your next drywall repair? Get started by contacting us below! 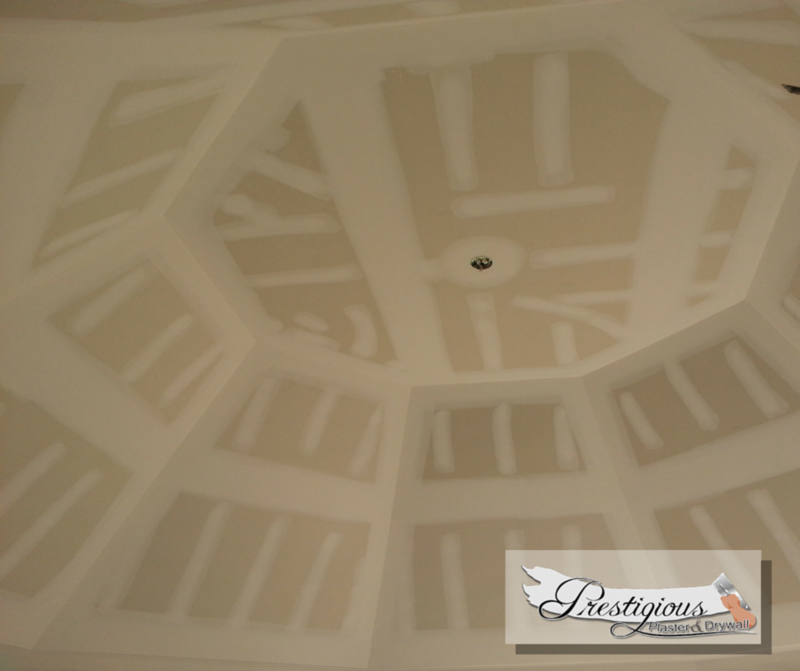 We recently patched the drywall for a custom in the Brittany trace subdivision in Apex, and we (and the customer) were pleased with the results. THe picture here doesn't do it justice (we're far better at drywall repair than photography!) Are you read to get that drywall job taken care of? contact us today! Robbery (especially with property damage) can be one of the more traumatic things to have happen to you. 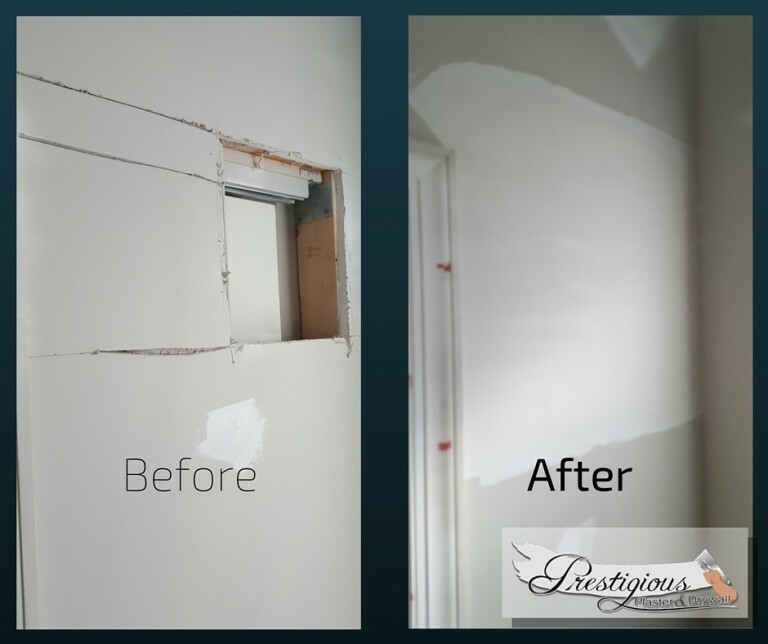 Recently a customer in Cary got in touch with us to repair drywall that was ruined as a result of home invasion. The last thing the customer needed was to think about doing these types of repairs themselves. We were happy to be a part of putting that unfortunate and scary incident behind them. If you find yourself in need of robbery-related repairs, get in touch. We can help get your home back to the way it should be. Contact us below. Good Drywall Work for Bad Plumbing in Southwest Cary. Recently we had a customer in Southwest Cary (almost to Holly Springs!) contact us because some bad plumbing had caused leaks that needed patching throughout the home. After the work was done, we patched 23 different spots in the house. 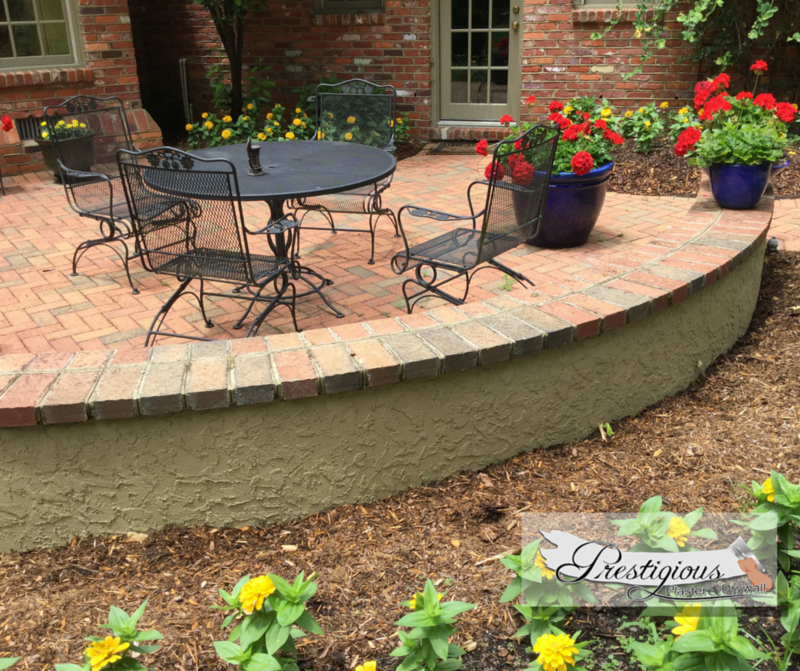 We were very pleased with the result, and the homeowner can rest easy, knowing that these patches are not going anywhere. Contact us today to get started! Repairing cracks in your drywall that result from the house settling over time can be costly, difficult, and a real pain in the neck. Recently we were able to handle all of it for a homeowner in Cary, NC. 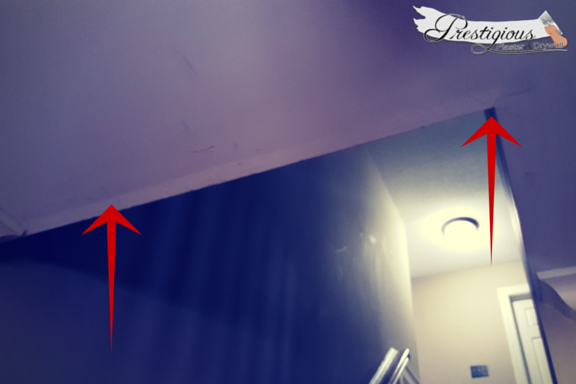 check out the pictures below: Repaired settling cracks in drywall. Ready for paint! More cosmetic settling crack repair, in Cary. 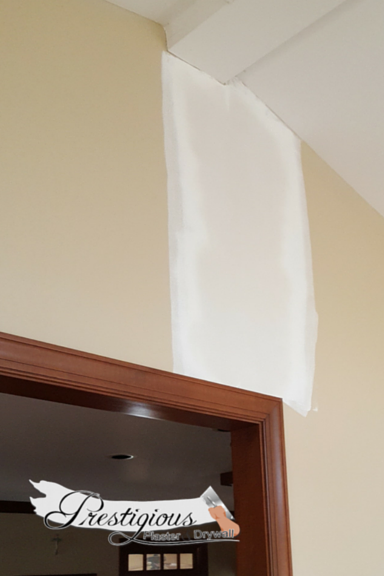 Don't wait to get your drywall repaired, and definitely don't try to do these repairs yourself. 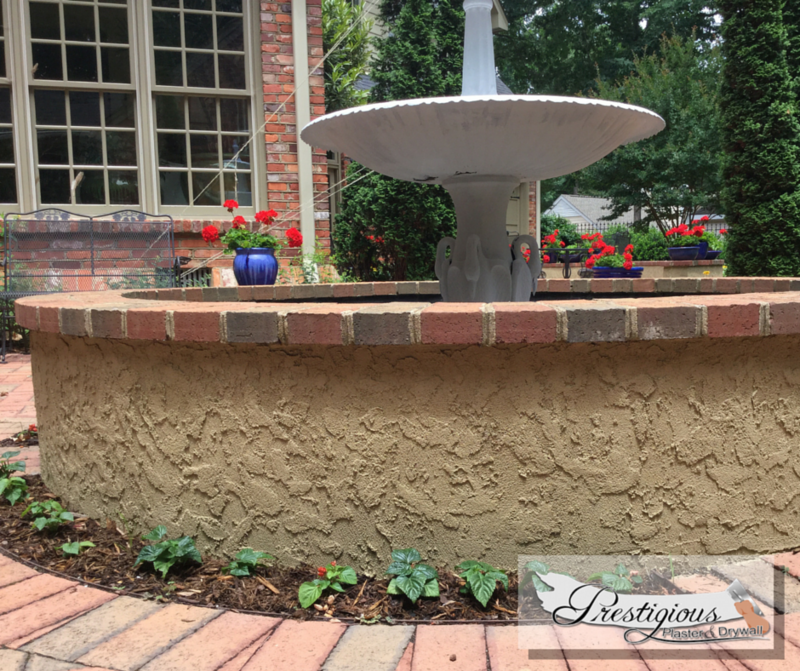 This is another fix we did for the great folks over in the Lochmere subdivision in beautiful east Cary. They were having some issues with the corner beads becoming cupped and visible on the drywall going up into their stairwell. Tim made quick work of it! You can see the cupped corner beads in this image. (added a filter to the image to make the damage more visible) You can see the cupped corner beads in this image. (added a filter to the image to make the damage more visible) To fix this themselves they'd have spent more time, and likely the same amount of money, and if our experience is correct, varying amounts of success on the outcome. Instead, they hired us, and it was done right, promptly, and cleanly! Here's the final result! ...and here is the after shot. what an improvement! Get in touch with Tim today! Don't put off those drywall or plaster repairs any longer, get in touch with Tim today. The form below goes straight to him. The photos don't do this one justice. We recently helped a customer by repairing a cracked splayed angle joint in a home in the beautiful Lochmere Neighborhood in Southeast Cary. This type of job is complicated to get correct if you try to "Do it Yourself." We were able to take care of this customer on the first try! 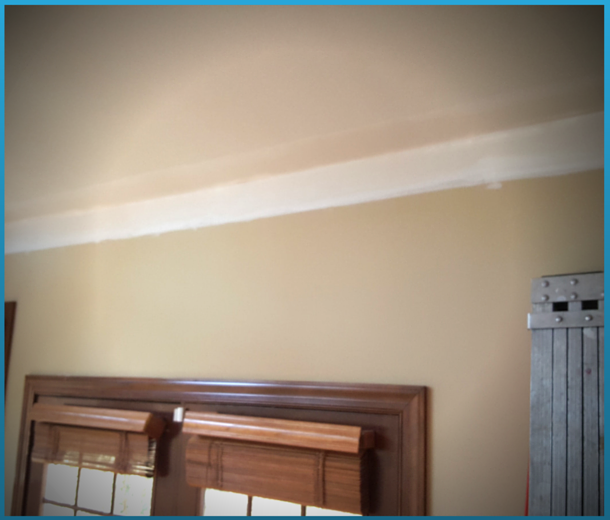 The image below shows the before/during with the tape still visible, and then the after ready to paint. Have you been putting off that "simple" drywall fix because it'll be too messy, or you just can't find the time? Call a pro. Tim didn't get that high rating on Angie's List by being bad at what he does. Contact him below! 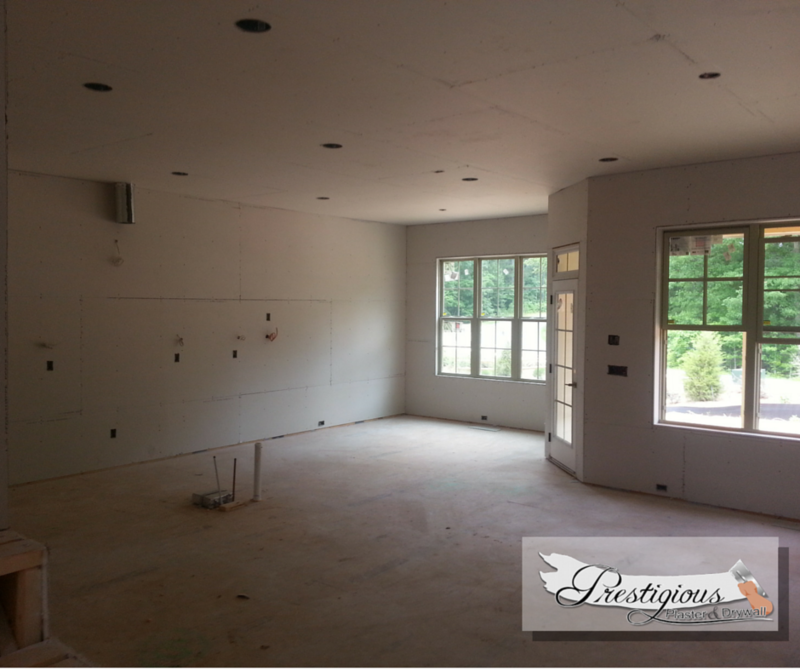 Before and After a Drywall Fix in Cary. Recently we fixed this door frame in Cary, and wanted to take a minute to give you a before and after shot. 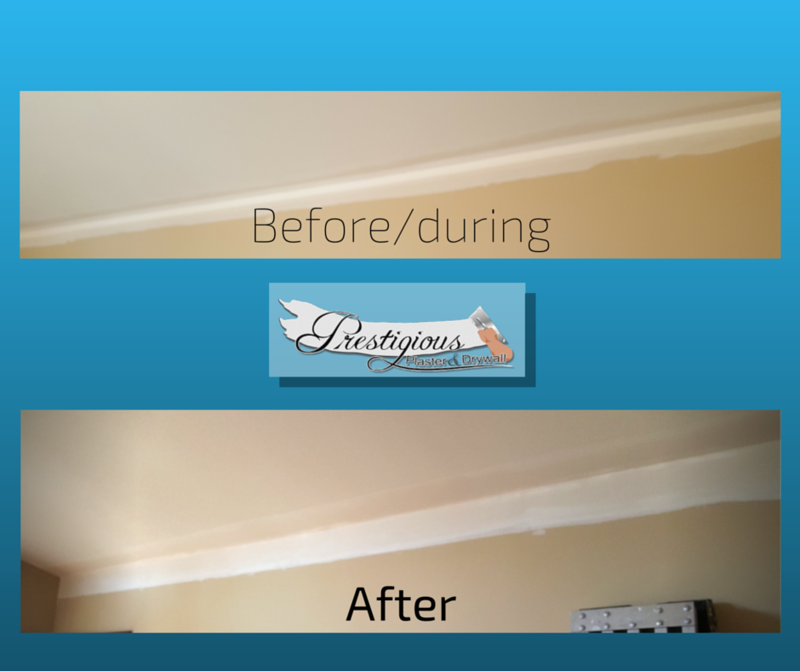 This type of fix takes us one trip, then we come back once it's dry to sand it (dust-free!) and you've repaired the unsightly drywall hole. This kind of job took us hours (not days) and we left the place cleaner than we found it. Contact us today Contact us now to get started. 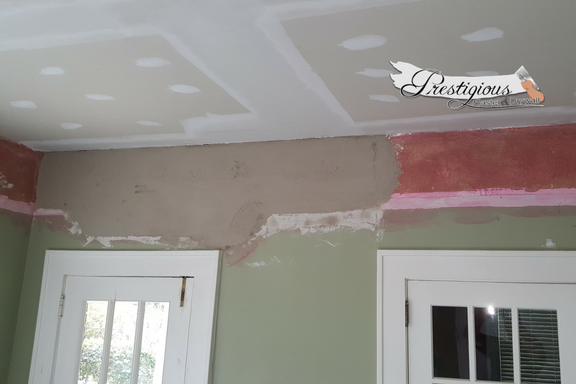 Before and after a Holly Springs Drywall patch. 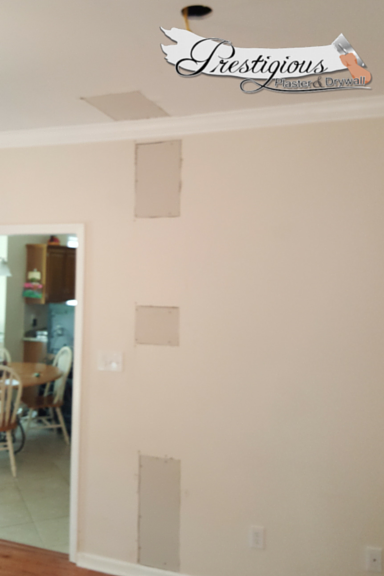 Do you have holes in your sheetrock you've been meaning to repair? 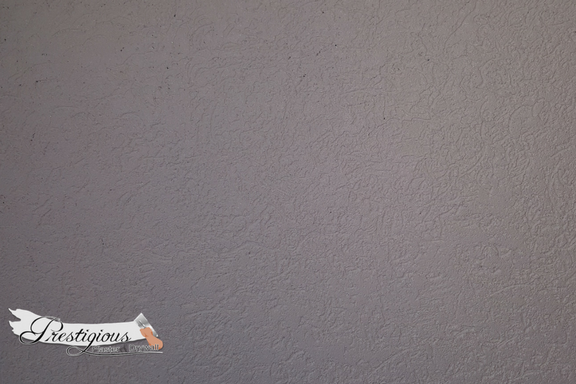 Aside from fact that drywall can protect your walls from fire, it sure does make for a better looking wall! Recently we did a quick repair in Holly Springs, and were quite pleased with the results: The customer needed a quick turnaround, so that's what they got: this only took Tim one trip. He's in and out, and your home is protected! 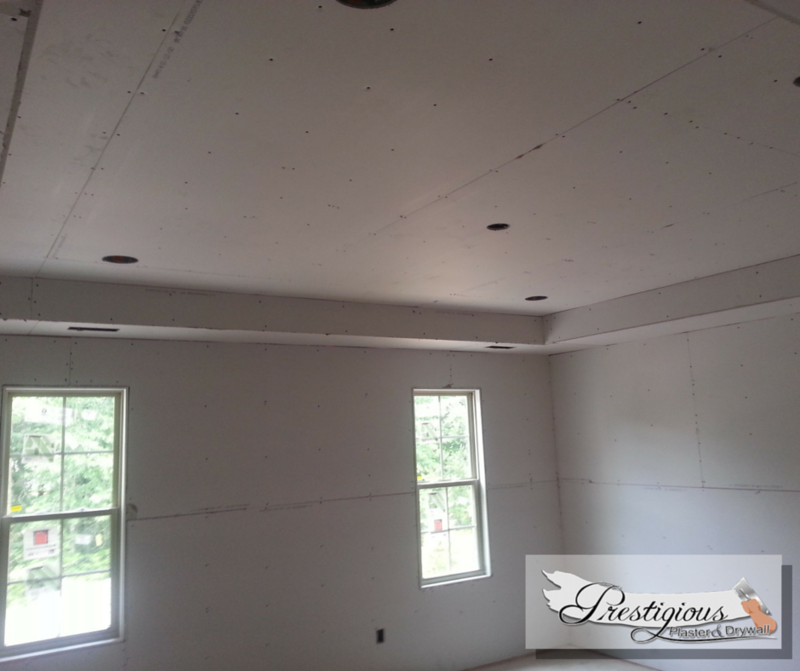 Here's the final result of the Holly Springs job: Gone are the unsightly cuts in the drywall. You should call Prestigious Plastering and drywall today. Gone are the unsightly cuts in the drywall. You should call Prestigious Plastering and drywall today. 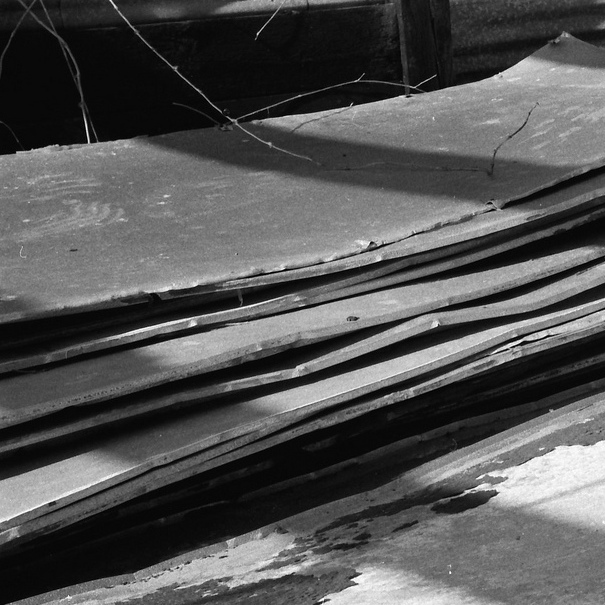 A compelling reason to not put off that drywall job any longer: fire protection. 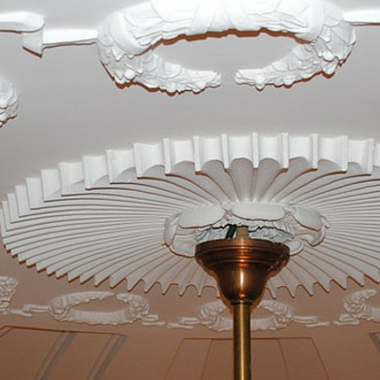 Creative Commons Image Attribution A compelling reason to not put off that drywall job any longer: fire protection. Creative Commons Image Attribution Editor's note: we're taking a break from posts highlighting our work (more are on the way) and using this opportunity to educate you on some fun facts about drywall. Did you know that your drywall is helping to protect your home or business in the event of a fire? Drywall is often called "sheet rock," which should give you a clue about how it is madeâit's actually sheets of rock. The specific rock used in drywall is gypsum, and it's a building material that has been used in various forms for thousands of years, dating all the way back (at least) to the Egyptian pyramids. Modern drywall is gypsum rock sandwiched between special sheets of paper. In addition to being easier to cart around and put on walls than actual slabs of rock, gypsum drywall holds crystalline water inside of it. So if a fire starts in your house, the water in the drywall evaporates (boils) once it reaches 220 degrees Fahrenheit. So during the time it takes to boil all of the water in the gypsum (and there can be as much as 2 quarts of water in 10 square feet of drywall), the wood behind the drywall is protected, and remains at just 220 degrees. That extra window of time for the fire department to get there and put out the fire could mean the difference between replacing drywall, and replacing the entire structure. So that hole in your drywall is not just ugly, it's adding a way for the flames of a fire to quickly spread to the structure of your building. 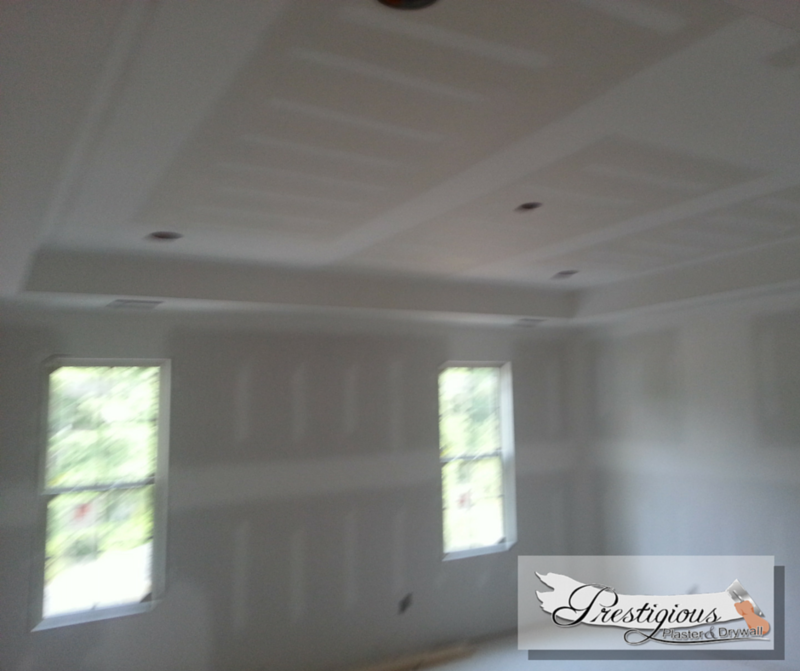 Call Prestigious Plastering and Drywall today for your drywall needs. If it's easier, you can use the contact form below to get in touch with Tim. 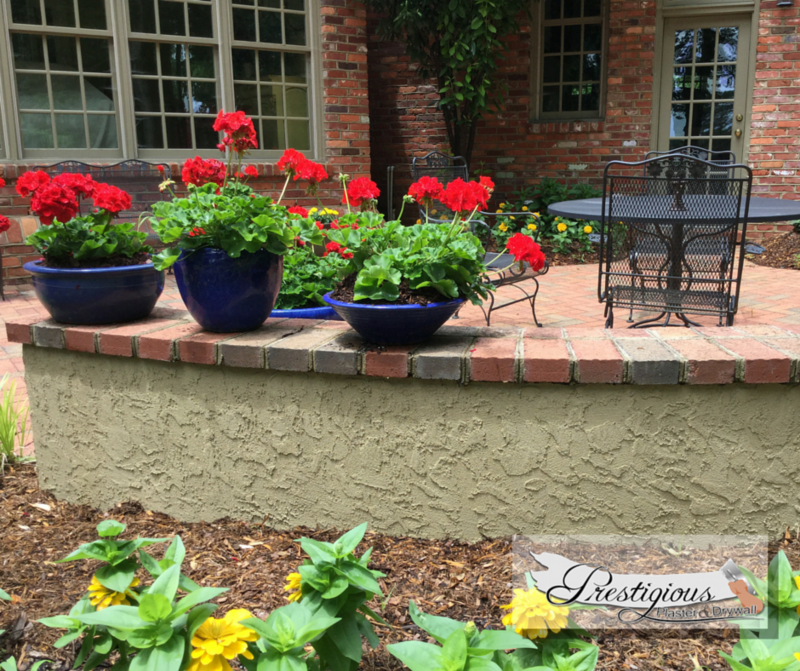 We look forward to helping you beautify and protect your home or business. 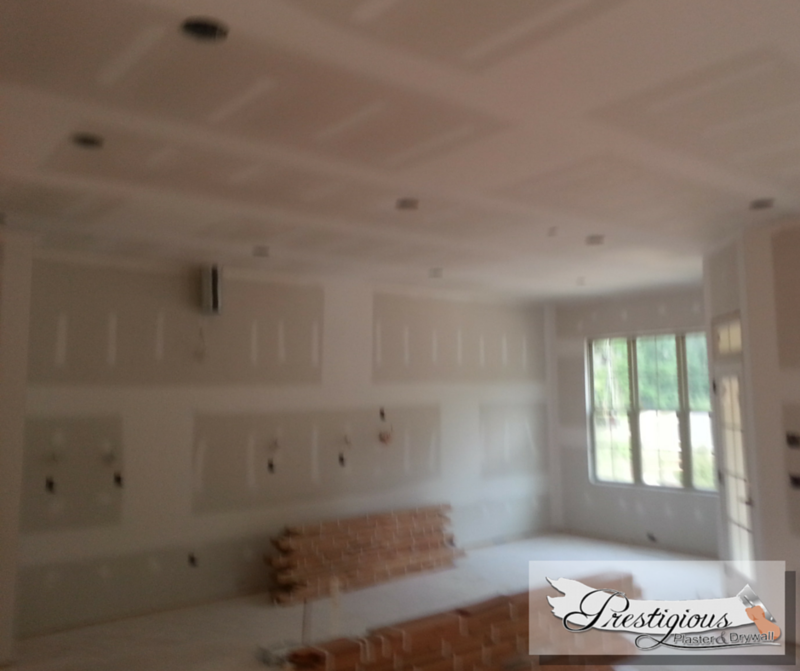 Last week we showed off some drywall hanging work we recently did for a home in the Sedgefield subdivision near Morrisville in Cary, NC. 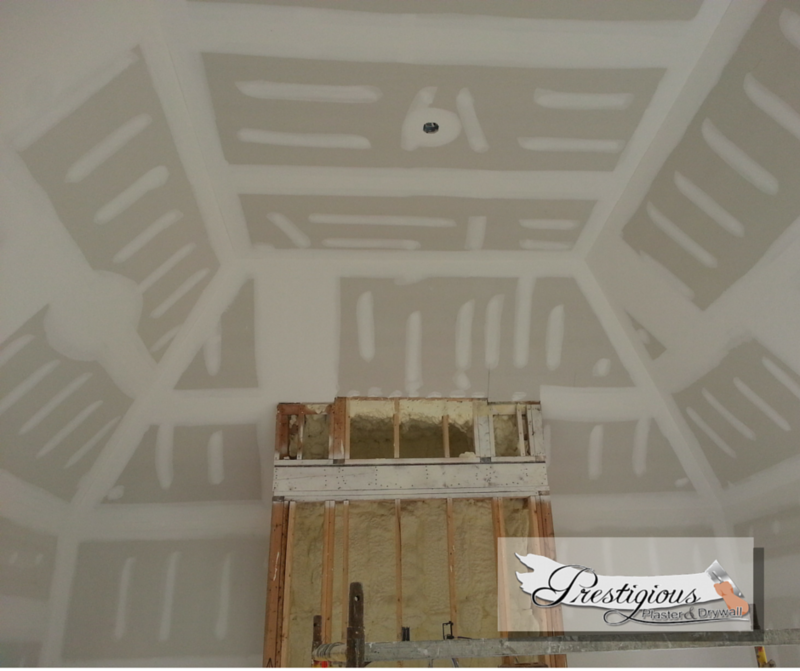 This week we've got some shots of the drywall finished process. It's all set for paint. We appreciate the responsibility of being trusted to do this great work, and wish the pictures did it justice. Contact us below if you have questions, or are ready to get started. You technically can hang drywall yourself. But a good contractor costs you less than you spend on them, once you factor replaced sheets, redoing low quality first-try work, and just pure hours saved by letting pros do it. 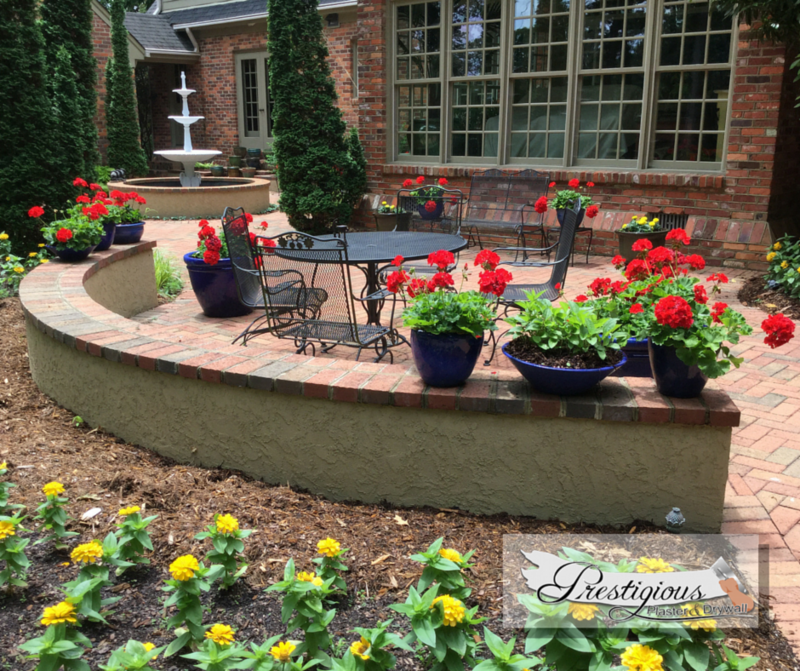 Recently we had the priviledge of handling the work for a home in the Sedgefield neighborhood in Cary. Below you can see some samples of the drywall hanging process. Next week we'll post a few more of the finishing process, all set for paint. 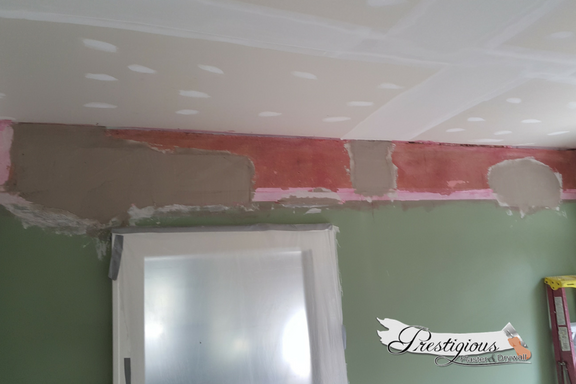 Drywall hanging, let the pros at Prestigious Plaster and Drywall handle it for you! Check back next week for photos of the finishing process. hanging drywall, before finishing and paint. 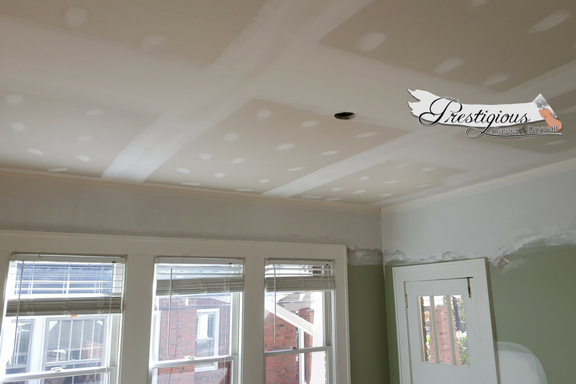 Drywall hanging, let the pros at Prestigious Plaster and Drywall handle it for you! Check back next week for photos of the finishing process. 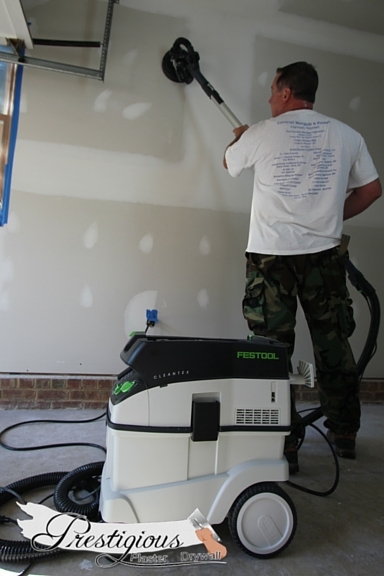 Need Dust-free Sanding in North Carolina? Trust your next commercial or residential job to the team tasked with keeping the dust off of _that_ chandelier. Trust your next commercial or residential job to the team tasked with keeping the dust off of _that_ chandelier. 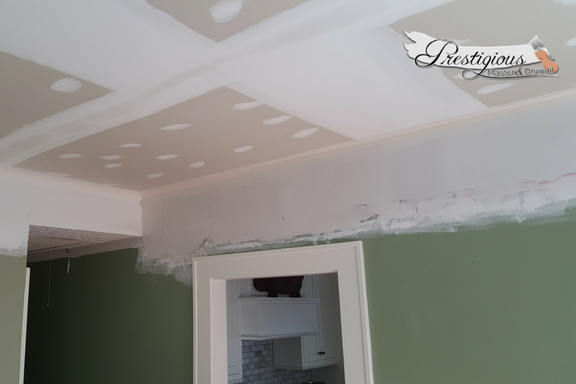 Tim Kiessling and the team at Prestigious Plastering and Drywall understand that sometimes you need a repair done, without the hassle of getting dust on every surface. That's why we utilize virtually dust free sanding on our drywall and plaster repairs. If you are wondering how to do dust-free sanding, it's partly good equipment, and partly experience. The bottom line for you is that we are able to keep your space looking good, and after we're done, we leave it better than we found it. Enclosed spaces and dust don't have to be the enemy of a good repair. Let us tackle your next project for you. Contact us today with what you need We look forward to helping! 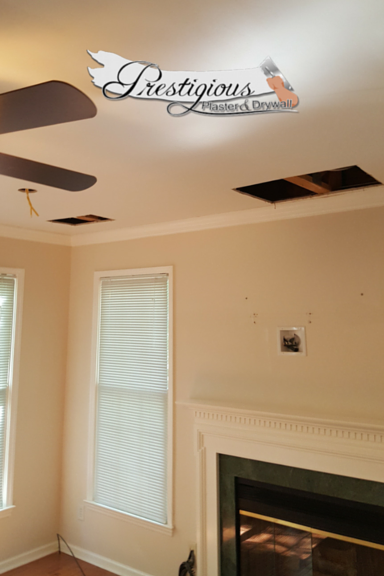 Recently we had the opportunity to install the drywall at a beautiful 2-story home in the Hills of Rosemont neighborhood in Durham/Chatham County, NC. The job required more than 600 sheets of drywall, and some non-standard corners! 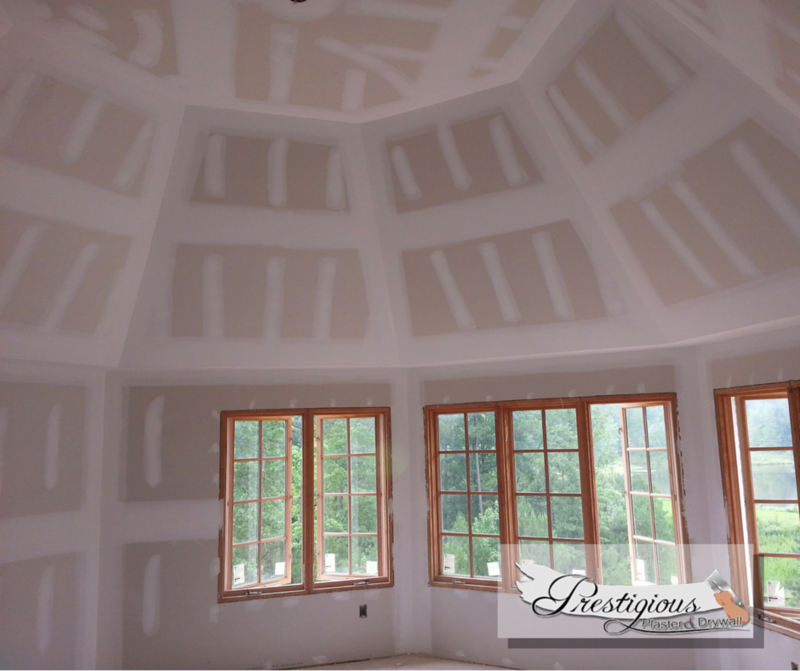 Here's the octagonal bonus room, with a vaulted ceiling: Octagonal room, showcases drywall installation technique We made quick work of what is not a simple installation in the Triangle. The view the other direction shows that our work extended all the way to the floor. The only thing better than the view? Not being distracted by poor craftsmanship on the sheet rock! The only thing better than the view? Not being distracted by poor craftsmanship on the sheet rock! Finally here's an image of the 2 story family room. 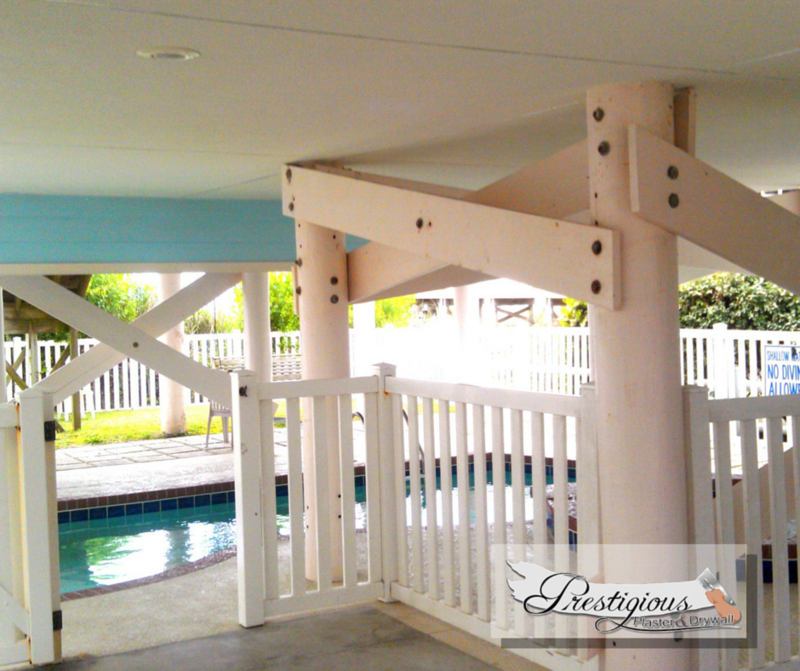 The 2 story family room required some special equipment for us, saving the customer time and money! The 2 story family room required some special equipment for us, saving the customer time and money! We greatly appreciate the business, and are happy that the homeowners can rest easily knowing the job was done right, the first time! When you are ready for drywall or plaster repair or installation, contact us today! We love working with great customers. 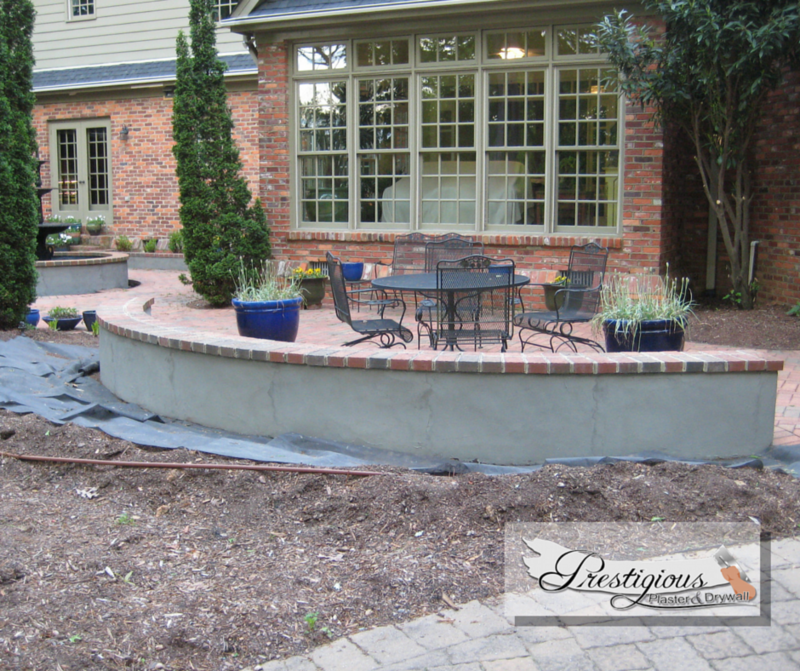 This recent job in Raleigh reminded us, as we were able to get these great customers a great deal on stucco work. The customer chose a great sage color to match the accents on the house. Contact us now to get your job started! 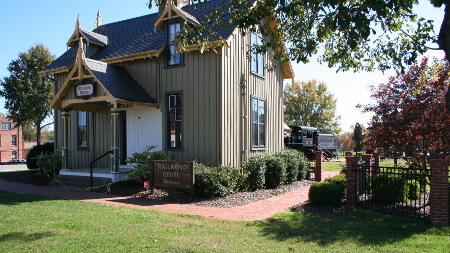 We made some needed repairs and restoration to the train Depot in Sanford, NC. We were able to restore the corner to it's former glory!Historic Train Depot Before our work ...and after! ...another great after shot. ...another great after shot. Contact us today to get started with your restoration job! 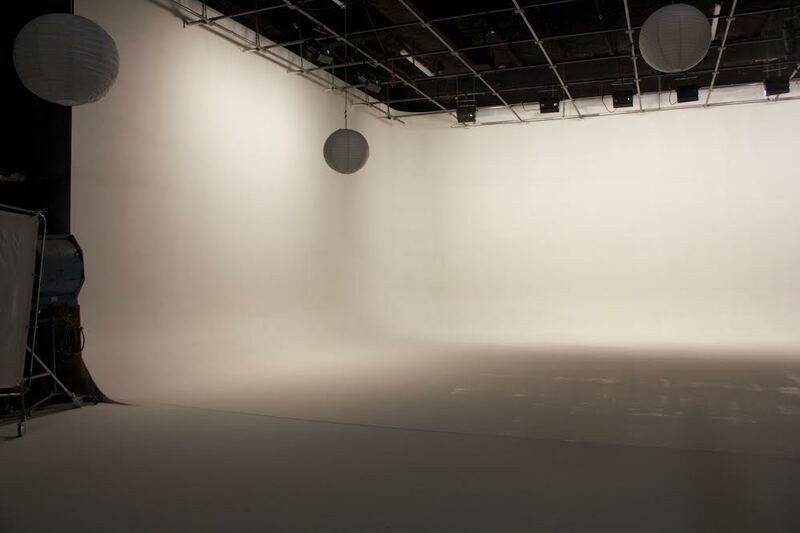 We recently finished a job for Trailblazer Studios in Raleigh, NC repaired cracks in their cyclorama, also referred to as a cyclorama wall or cyc wall which is a curved wall used as a background of a stage set to suggest unlimited space. 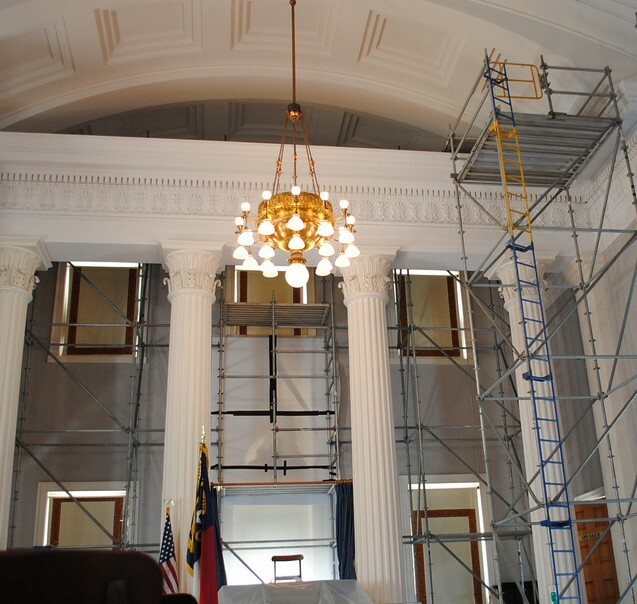 When the North Carolina State Capital building in Downtown Raleigh was in need of repair, they called Tim Kiessling of Prestigious Plaster and Drywall. They, like you, wanted to get the job done right, the first time. Here's a photo of that job. We were proud to restore such a historic building to its former glory! 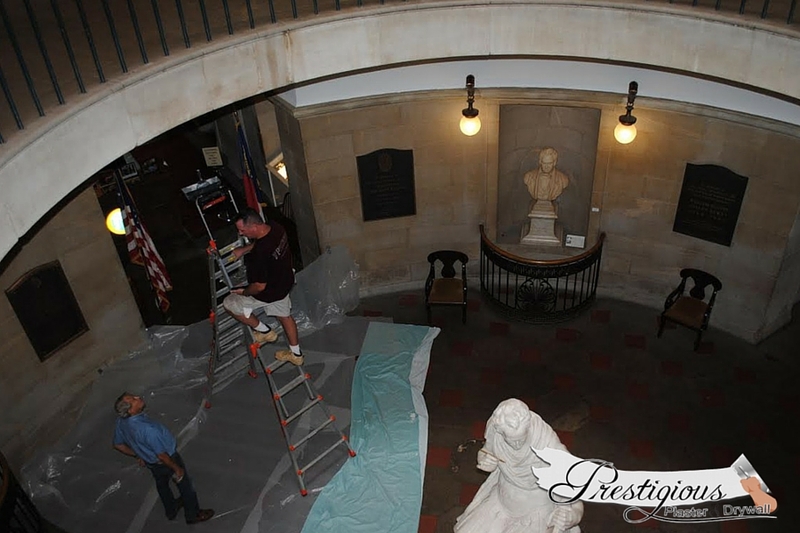 Here we are helping to make our State Capital building shine. Call us today. Are you ready to get started with that plaster or drywall repair in the Triangle area? We're ready to help.